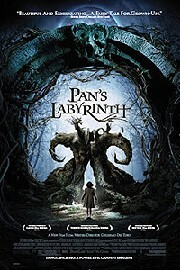 So I went and saw Pan's Labyrinth on opening night last Friday night with Denise, Molly and Adam at the Uptown theater. If you haven't heard of it yet, it's actually a Spanish film that's been getting incredible reviews. On Metacritic's all-time list, it's currently #4. I've never seen so many people at the Uptown before. The line of freezing movie-goers stretched around the block. Even the movie itself started about an hour late because of the difficulties of getting so many people out of the previous showing and getting all of us in. It was also due to the fact that Doug Jones himself (who played Pan in the film) was there and spoke to the crowd beforehand. The movie itself was quite excellent. The acting and cinematography were amazing. The only thing that ruined it for me was the ridiculously tall guy sitting directly in front of me. I had to lean way to one side just to try to see the screen (not to mention the subtitles)!